1Get your favorite browser going and head to Skype. You see a very fancy landing page, with all the hallmarks of a Microsoft Metro web page. 2Up at the top, click or tap Downloads. You see another fancy Metro-inspired page. At the bottom it says Get Skype for Windows 8. That’s NOT the button you want to push — if you go that way, you get steered (eventually) to the Metro Skype app. 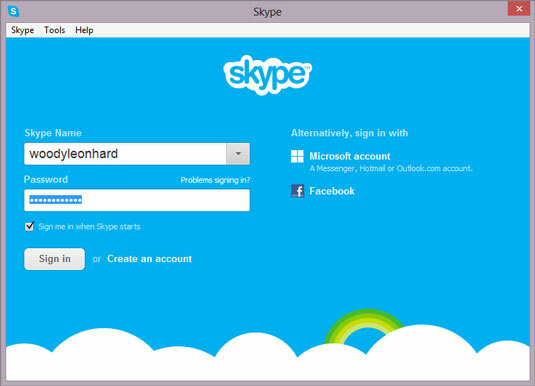 3Scroll down the page to the Or Choose Another Version section, and then click Learn about Skype for Windows Desktop. You see another fancy . . . well, you get the idea. Somewhere near the bottom of the page, you see a button marked Get Skype for Windows Desktop. 4Follow the instructions to download the installer and run the installer. 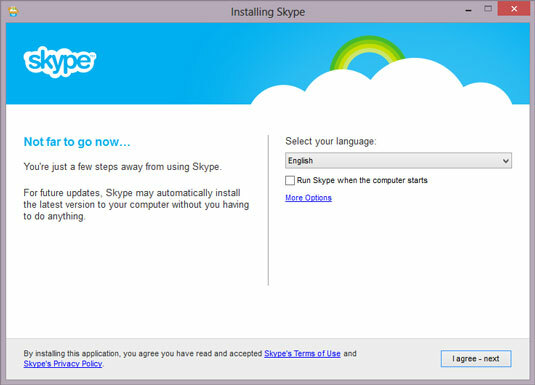 You see an Installing Skype dialog box. 5Click or tap I Agree – Next. If you use Skype all the time, by all means keep the Run Skype When the Computer Starts box checked. If you allow Skype to run all the time, it acts as a conduit for Skype conversations all around you — passing those conversations through your computer and sending them out the other side. If you’re a heavy Skype user, you’re under some sort of moral obligation to keep the whole chain working. 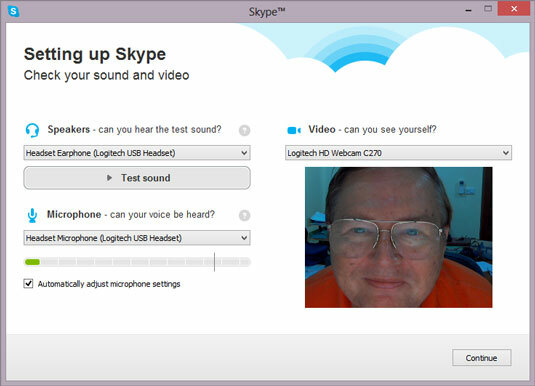 6Uncheck the Install Skype Click to Call box and choose Continue. Then Microsoft, er, Skype, so kindly offers to make Bing your default search engine and make MSN your home page. Er, NOT! 7Uncheck the boxes to make Bing your default search engine and make MSN your home page, and choose Continue. Skype whirs and clicks for a while, gets itself installed, and sets up that pass-through communication, and ultimately you get to the sign in screen shown. 8Check the box allowing Skype to communicate over Private networks. Unless you want to use Skype while connected to a public Wi-Fi service (which sounds reasonable, but it’s not very secure), deselect the second box. Select Allow Access. 10If something isn’t working, now’s the time to figure out what and why and how. When you have three thumbs up, click or tap Continue. The setup offers to pin a profile picture on your ugly mug — or is it the other way around? — and you can certainly do so, if that’s your thing. You’re ready to start using Skype.